Madden Football 2006 for sale already! The annual cash cow juggernaut that is EA’s Madden NFL Football 2005 came out a couple of weeks ago. It’s selling like wildfire. However, in a blatant act of “Give us $50 each year for the latest iteration of the game”, some stores are taking pre-orders for the Madden 2006 version already, which is listed with a ship date of August 8, 2005. Now, I know there’s a version every year. I know sports games fans get bilked more than any other franchise around. But having pre-orders up already (at EB Games & Gamestop) when the current one is fresh? That seems a bit much to me. I think we all knew that ESPN’s NFL 2k5 game wasn’t going to sell as much as Madden. It’s like me coming up with my own operating system that’s as good as Microsoft’s. You can do it, but it won’t sell as well. ESPN/Take 2 tried a cool move by making their current game only $20. It’s a maneuver that worked on me. Because Madden’s game was finally Xbox Live capable, I was going to move there, after the death of the Microsoft line of football games. However, ESPN came in, and it’s hard to beat the $20 price point over the $50 one for Madden. Too bad more people couldn’t see that, it’s a great game. But taking pre-orders for the next version of the game when the current one is fresh off the mint? Seems a bit greedy, guys. I’ve been playing video games for a LONG LONG time. I’ve played a lot of bad ones in my time. I’ve played a lot of good ones. The one I want to talk about most definitely falls in the BAD category. While I’ve not personally played the game, I ran across this review of Big Rigs: Over the Road Racing. This qualifies as one of the best reviews of a bad game I’ve ever read. You know it’s great when the review actually says “Please do not play this game. We cannot stress this enough.”. It’s a great game review. What’s even funnier is the video review at the bottom of the page. It requires you to be a Gamespot subscriber to view, but it quite possibly is the funniest thing I’ve seen in awhile. It also has gameplay footage which is quite hysterical in and of itself. How someone could release such a steaming pile like this as a boxed video game is beyond me. And it’s got the name Activision on it, too. It’s incomprehensible how a game company could release this. It boggles the mind. If you’re feeling deranged or psychotic enough, there’s a place to buy it. Here. Over the weekend, my brother and I attended the Austin Gaming Expo which took place in Round Rock, Texas. Most of it was related to classic gaming, with a big emphasis on the Atari 2600, but there was more modern stuff there (in fact, there were two seperate Halo tournaments going on). It was nice for me personally, since I don’t get to see my brother much (as I live in Garland, TX and he in Norristown, PA). My brother flew to Dallas, and the two of us drove to Austin for the show. We didn’t buy much, only 5 Atari 2600 games. That drives our collection (my brother’s and mine) to something like 475 games. Our complete collection of Atari 2600 cartridges can be seen here. Anyway, the show was great, although two things I felt were negative. First it was too small. Too many people showed up, and it quickly became a sea of humanity. Plus there wasn’t enough trading for my tastes. There needed to be more traders/sellers. There was some of that, but not nearly enough. 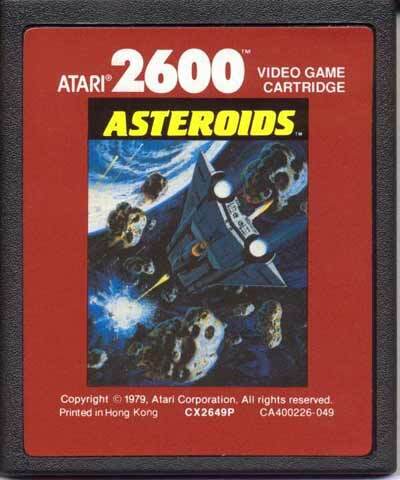 Speaking of that, if anyone reading this happens to have an extra copy of Red Asteroids for the Atari 2600 (That’s the Red label PAL cart – Picture of it here – please let me know. I want one. I’m looking forward to the 2004 show, it should be much better. Oh, and hi to John Romero who I bumped into in in the lobby after the show was over. Update Aug 2006: The 2600 site I used to have which I reference in this site no longer exists, so I pulled out the (now broken) links.